Asia Pacific Superyachts New Zealand expands services to give clients direct access to all refit partners. After many years in New Zealand’s superyacht industry, the team behind the agency has an in-depth understanding of what New Zealand’s refit providers are capable of and is using that personal knowledge to guide yachts to the right providers for the project. Recognising successful refits require knowledgeable specialists, the shore-side support company has pulled together a selection of New Zealand’s best refit service providers to deliver a centralised service. 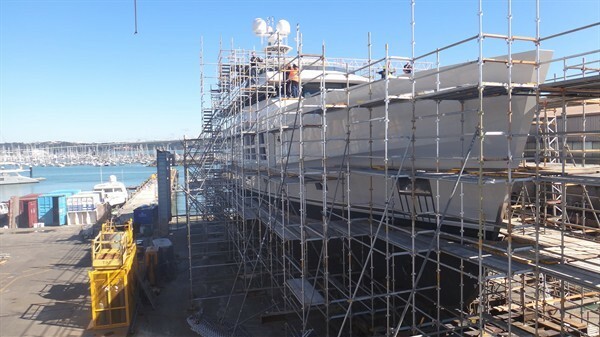 With New Zealand’s top refit yards Titan Marine Engineering, Oceania Marine and Babcock (NZ) Ltd, and specialist large yacht refit project managers MML on board, the new refit collective is able to provide the best New Zealand’s refit services have to offer. The expansion comes as the agency, led by Jeanette Tobin and Duthie Lidgard, saw an increasing need for quality refit services for yachts cruising the Pacific. With yachts already turning to New Zealand for refit, maintenance and survey work, the agency was determined to provide an unbiased selection of providers. Having vetted the partners it works with, Asia Pacific Superyachts New Zealand is able to offer yachts proven refit services within the Pacific nation. Those services include access to a dry dock of 181-metres, a 1500 GRT slipway in the heart of central Auckland, a 100T travel lift, and repair berth to 190m. Contractors with a proven track record including work on Arctic P, Mayan Queen, A and a host of other yachts are ready to do a complete refit or a five- or 10-year survey. Those contractors work to ABS, LLOYDS, International Classification Society Bureau Veritas and MCA codes and classifications. “After 12 years of business we know who are the most reliable and cost-effective contractors in the country. With a strong track record in agency work and the sourcing of parts, moving in the direction of refit was a natural progression for the team,” says Lidgard. Asia Pacific Superyachts New Zealand has aligned with refit providers with proven, unblemished records to shorten the selection process for its clients. The agency doesn’t charge for this service and is happy to introduce the yacht to its vetted yards and project managers and oversee the works, or simply make the introduction. Recent projects by Asia Pacific Superyachts New Zealand’s partners include a seven-year, multi-faceted refit of Arctic P, an extensive refit of a Damen Sea Axe, and a full refit of the heritage Feadship Alchemy.